Unfortunately in this world things do not last forever. Homeowners know this all too well. Sometimes it feels like things are breaking every time you turn around. The exhaust fans in your home can sometimes take a back seat on the repair list but here are three reasons you might want to consider replacing your exhaust fan sooner rather than later. Reason 1 – It no longer works. Okay, this is a fairly obvious reason, but you would be surprised at the number of homes across the country that have exhaust fans installed that no longer are operational. The challenge is that it falls into the category or “when I get around to it”. Unfortunately this is a big mistake. As we have outlined in previous posts, indoor air quality can really affect the home and the people inside it. Reason 2 – The sound level is now almost unbearable. There are a multitude of reasons why the exhaust fan’s sound level has increased. The main reasons are typically that a weld on the fan housing has released, the fan blade if out of balance, or the fan was just loud to start with. NOTE: Sometime an increase in sound level can be due to a build up of dirt or debris on the fan blade or in the ducting, a damper that is not opening properly or other maintenance issues. Before replacing the fan, make sure to check these items. This is a slightly more difficult decision than if the fan is not working at all. Since the fan is still providing ventilation, there is not an immediate need to replace. What typically happens however is that because of the elevated sound level, the fan is not utilized which at that point, it is the same as if the fan was not working at all. Reason 3 – The fan is not providing the proper amount of ventilation. This is one where you want to troubleshoot the symptom first. It could be that there is a clog in your ductwork, a buildup of dust or dirt on the fan blade or a build up of dust or dirt inside of the fan housing. These can all contribute to decreased performance and if they are the case, some maintenance to the fan should clear up the issue. If that is not the case, many times it is because the wrong size fan was originally installed. Most experts agree that you should look for a fan that provides 1 CFM (cubic feet per minute of ventilation) per 1 square foot. So if your bathroom is 10 by 10, you need 100CFM. The trouble with that math is there are other factors involved. Items such as length and type of ductwork, type of usage of the bathroom, geographic location, and many more can have a direct impact. In some cases you might need to increase the amount of airflow of your fan considerably to meet the needs of your bathroom. A word to the wise on this point. You should have a realistic expectation of what you want the exhaust fan to do. If you are taking steam showers in a sub zero climate, the amount of condensation that will build up will require a small jet engine to keep up with it. If issues like condensation, the mirror fogging up, etc. are happening, a larger fan will help, but you might also want to consider the amount of time the fan is running. 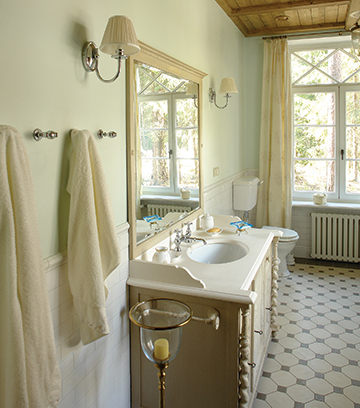 In higher humidity situations, the fan might need to run from 20 minutes to hours after the bathroom has been used. Fans with humidity sensors or timers can be very effective in making sure the proper amount of ventilation occurs. The last thing we want is for you to have the same issues after taking the time and energy to replace your existing one. If you are not sure, consult a professional. Visit www.airkinglimited.com for more information and to see Air King’s full line of exhaust fan products.